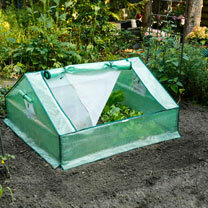 Create the optimal growing conditions without the need for a large greenhouse. The weather proof construction of this polythene coldframe will protect your plants from the elements whilst allowing for ventilation through the zip opening windows complete with removable insect protection mesh to stop unwanted visitors from getting in. Made from UV resistant material. Dimensions: length 120cm (4’) x width 120cm (4’) x height 60cm (2').